Exercise delivers surprising benefits for all those people who suffer from diabetes. Exercise helps in lowering stress levels and blood sugar levels in individuals suffering from diabetes. 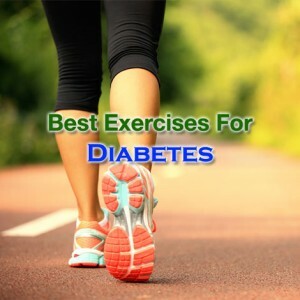 There are many exercises that can benefit diabetic people but it is always best to go for the exercises that turn out to be the right options. Aerobic exercise is considered one of the best exercises for diabetes. However, there are various other exercises that can also be of good help in controlling sugar levels. Walking is an exercise that is considered one of the easiest and the best exercises for diabetes. This is because it can be done almost anywhere. This exercise is highly recommended for people suffering from diabetes. Brisk walking for minimum thirty minutes can help in increasing physical activity. This is a Chinese exercise form that makes use of slow and smooth body movements for relaxing the body and the mind. Diabetic patients who are successful in completing tai chi sessions find significant improvements in their levels of blood sugar along with increased mental health, energy and vitality. Yoga is one of the best exercises for diabetes you should follow. Yoga is a conventional exercise form incorporating fluid movements which help in building balance, strength and flexibility. Yoga can be of good help for people with diabetes as it helps in improving nerve function and levels of blood glucose. Swimming is yet another effective exercise for all those people suffering from diabetes. It is a kind of aerobic exercise which is considered perfect for diabetics because it does not put any pressure on the joints. Just like aerobics, dancing encourages flexible movement of the body and helps in boosting power and in improving memory. Dancing helps in reducing the risk of contracting Alzheimer’s disease which is an associated condition with diabetes. Dancing is one of the most exciting methods of increasing physical activity.